There’s nothing like Daytona, and the first weekend that starts the NASCAR season. It’s hard to describe what it’s like arriving at Daytona itself. It has almost a first day back at school feeling. There’s turnover every year, kind of like a couple kids moving away. And of course, there are a few new faces every year, kind of like a couple new kids moved into town. You’re back with all the other drivers, your classmates. There’s a ton of anticipation, mainly because you’ve been preparing for the races all winter long. And this time out, after Kyle Busch had his crash on Saturday, you could sense fear in a lot of drivers, too. Expectations for the week were high, especially for us. Daytona’s a restrictor plate race, and in our last restrictor plate race at Talladega, we’d won. To be honest, we felt like we could win every race we were in, and as it turned out, we were in contention to win all of them. In the end, things didn’t work out in Cup or XFINITY. 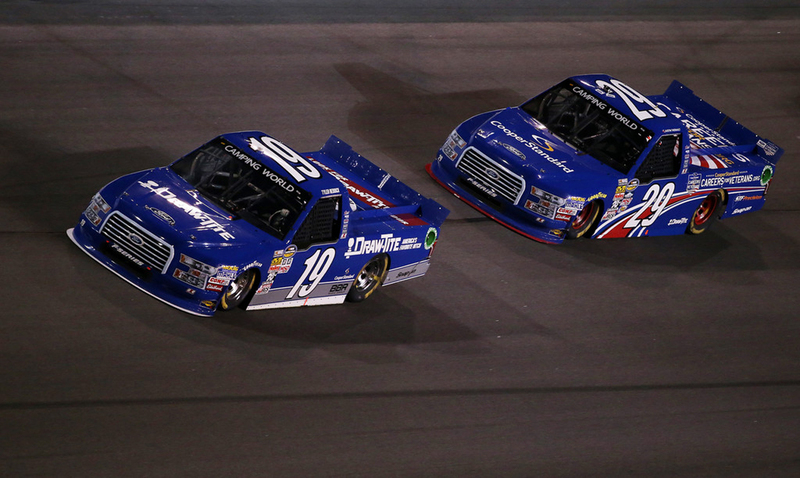 But in the truck series, I had one of the most thrilling, nerve-wracking experiences of my life. For the first time ever, I won a race at Daytona, and it came as an owner. It’s hard to explain the difference between winning as a driver, and winning as an owner. As a driver, your responsibility is simple. You’re going to do whatever you can to win. You’re going to try and drive your best. And if you don’t win, there’ll be another opportunity another day. As an owner, I get really nervous. When I think we have a shot to win, I start thinking about all the ramifications. You think of all the people you’re responsible for, and how much it would mean to them to end up in Victory Lane. Compared to being a driver, that burden is kind of overwhelming. When you do have success, it’s almost more of a relief. You’re happy and proud to see the members of your team do well. But watching it all unfold is agonizing, at least to me. One of the things about truck racing that’s different from the other two series is that the race distance is a lot shorter. In some ways, that makes it tougher. If you have a team mistake — a loose wheel or a pit road violation, something like that — it’s very hard to recover. As an owner, there’s nothing fun about that. A LOT GOES THROUGH MY MIND AS THE OWNER OF A TRUCK TEAM, WHETHER I’M DRIVING THAT WEEKEND OR NOT. What makes owning a truck team especially stressful for me is that my family had a truck team growing up. I’ve spotted. I’ve crew chiefed. I’ve been an engineer, I’ve been a scorer. I’ve gone over the wall as a pit crew guy. I’ve had nearly every job you can have on a racing team except for working on the engine. And because I’ve done all these things, I see everything that’s happening with a critical eye: pit calls, setup calls, driver moves. I can’t help it. So for that reason, I actually try and separate myself from the group during races. I don’t want to be a micromanager. I want my team to do its thing, and I want them to look for answers to challenges they face on their own. That’s how I’ve always learned. They have to learn racing lessons for themselves. I want to be supportive and to answer questions when they ask, ‘What could we have done better?’ But I want them to be the ones to ask. There have been people with very successful truck teams in the past, but usually those teams have had older drivers who really have no chance of advancing to the other racing series. 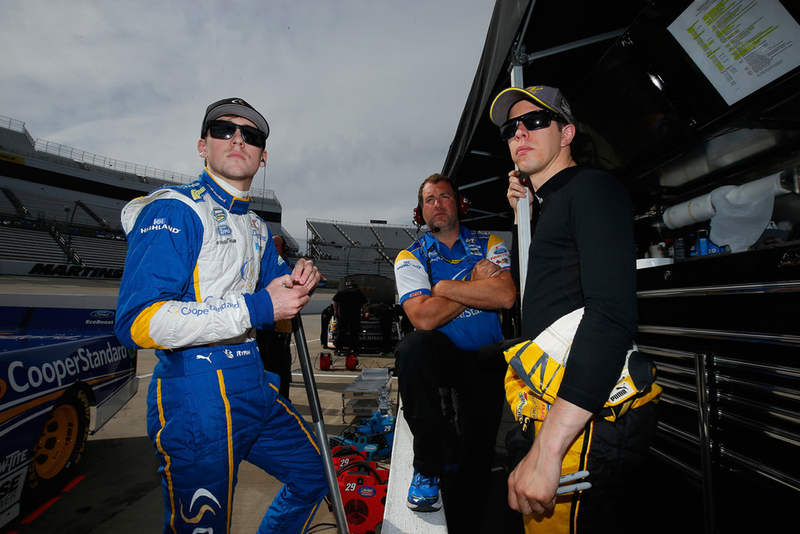 When it comes to my racing team, BKR, I have a very specific philosophy about the kinds of crew members and drivers we want, and what we’re trying to achieve. I’m looking for people with talent and the potential to get to Cup, and I want to help them get there. If the Cup Series is the NFL, I want my team to be Alabama. I want the best young players to come to BKR. 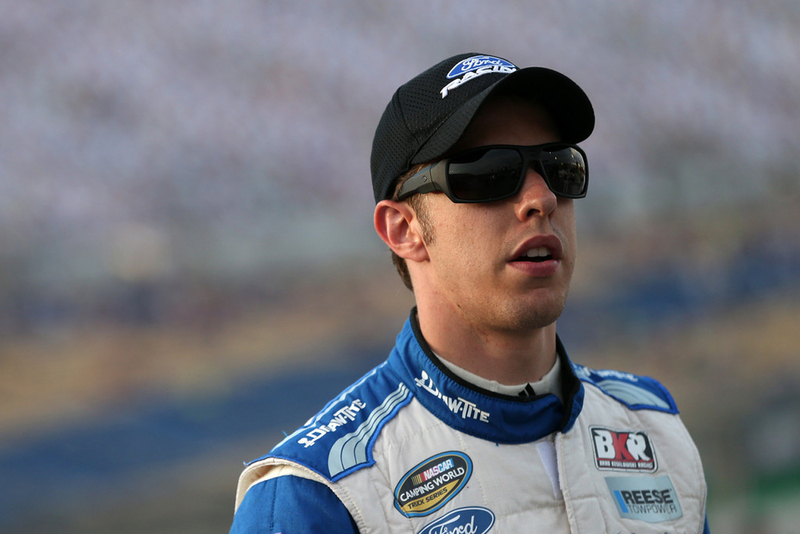 AFTER TWO AND A HALF SEASONS AT BKR, RYAN BLANEY GOT AN OPPORTUNITY IN THE CUP SERIES. THAT’S WHAT I WANT FOR OUR DRIVERS. And the reason I want that is because of what I had to go through myself. I created BKR to be the image of what I would have wanted 10 years ago, but didn’t have. When I first met with JR Motorsports in 2007, I was six feet tall, skinny, a big head of blonde hair and basically broke. I walked into their shop wearing a pair of old, unpressed khakis, a Polo shirt that was too big, and a pair of tennis shoes. Honestly, no, I didn’t, but I knew it. And eventually, I made them believe in me. That kind of self-awareness — the ability to recognize what you need to make a team believe in you — is a quality I look for in my drivers. Because talent alone is not enough to grow. If a team believes in someone, the sky is kind of the limit. But once a team doesn’t believe in someone, it falls apart really quick. That’s one of the early lessons I learned in my career. My truck drivers, Tyler Reddick and Austin Theriault, make their teams believe in them, and they do it in very different ways. That’s the funny thing: they’re actually complete opposites. One is from Maine. The other’s from California. Their demeanor and attitude are complete opposites. So are their gifts as drivers. Tyler is just a natural behind the wheel, plain and simple. You can’t teach some of the things he can do in a race car. Austin, meanwhile, has a high-racing IQ with all the intangibles. He has a great work ethic. He studies hard. And he thinks about things — maybe almost too much — which is good. I love that about him. We paired them together precisely because we want them to complement each other. My hope is that they’ll pick up a little of each other’s best qualities, drive each other to excel and improve, and one day, be competing in the higher series for championships. 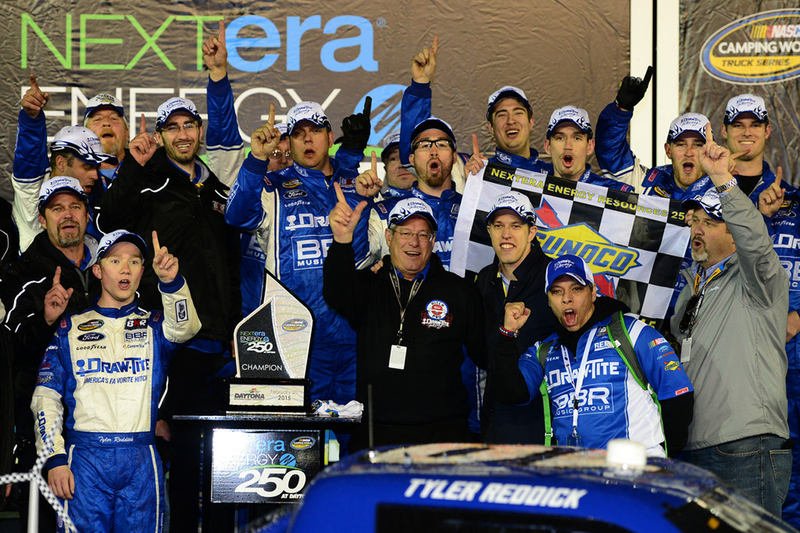 When it came to the Daytona truck race, the NextEra Energy Resources 250, Team BKR showed exactly what we’re capable of. Things started off well. Tyler and Austin qualified third and fourth respectively, and that strong qualifying effort — along with some great teamwork — put them into position to really kind of dictate the ebb and flow of the race. From there, they executed on the restarts and on the pit stops, and never gave up track position, which was impressive. And when the big wrecks happened, they were in front of them all. That’s really what was going through my head. That’s the downside of having seen racing from so many different angles. You start thinking about all the ways things can go south on you. But they didn’t. We won. When I was a kid and my dad won races, one of the most thrilling things was rushing to Victory Lane. My family and I would be sitting in the grandstands, maybe about 50 to 100 yards away from where the post-race trophy would be given. I can remember the feeling: How fast can we get to Victory Lane? I didn’t want to miss a thing. But we made it there along with a few hundred representatives of Cequent and Draw-Tite, the sponsor of Tyler’s race-winning truck. That’s one of the unique things about NASCAR. You don’t see a corporate sponsor hop onto a stage with Tom Brady and Bill Belichick after winning the Super Bowl. But in NASCAR if you sponsor a car, you’re taking pictures in Victory Lane with the driver and his pit crew. Needless to say, the Draw-Tite folks were pretty giddy, too. As we celebrated the win, a lot of things went through my mind. My family has been racing at Daytona since the 1960s. This was the first race we’d ever won during that entire time. But it was about even more than that, too. It was a huge validation of our program, and hopefully, shows other prospects who are looking for an opportunity what they can accomplish as part of BKR. It also spoke directly to our sponsors about what we’re about, and signaled that they’re part of a winning team. And hopefully, it’s another step toward the future, toward securing our business, growing our drivers, and taking care of our employees and their families for a long time to come.